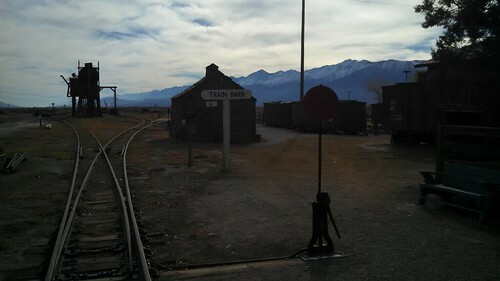 Around Noon today we drove out to Laws, California to the Laws Railroad Museum and Historical Site. 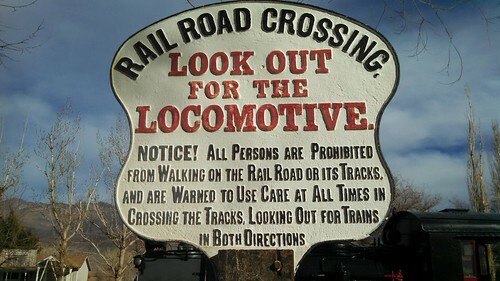 Laws was the northern terminus of the last common-carrier narrow-gauge railroad in the west, the Keeler-to-Laws segment of the former Carson & Colorado Railway. The C&C ran from Mound House (not too far from where we live in Fernley) to Keeler. 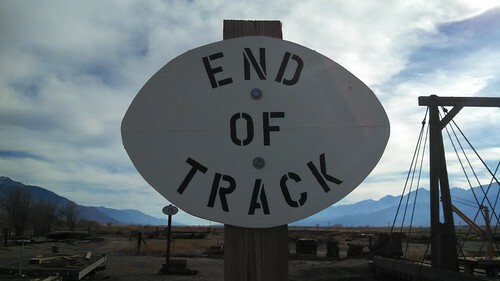 The SP bought it, standard-gauged the section from Mound House to Tonopah Junction to connect with the Tonopah & Goldfield Railroad (and hence to Las Vegas by diverse lines), abandoned in 1943 the section from Mina to Laws, and finally ended operation Keeler-Laws on April 30, 1960. 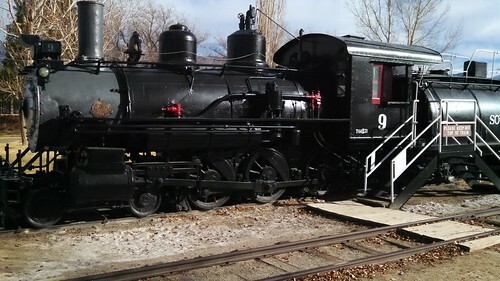 The railroad pulled up the track south of Laws but donated the Laws Depot site, locomotive #9 (the "Slim Princess"), and the associated buildings to the City of Bishop. Today the site is run by the Bishop Museum & Historical Society and is open daily year around. 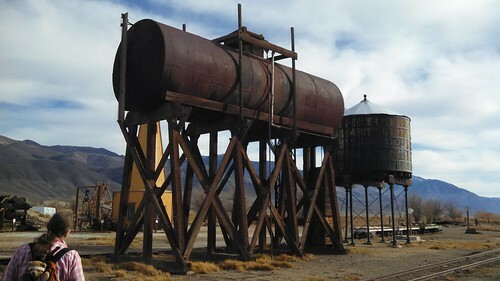 Besides the railroad buildings, many other old buildings from the area have been moved here and restored, and the museum includes a fascinating look back at the early days of the Owens Valley. As with other entries, click through the photos to see more related photos. 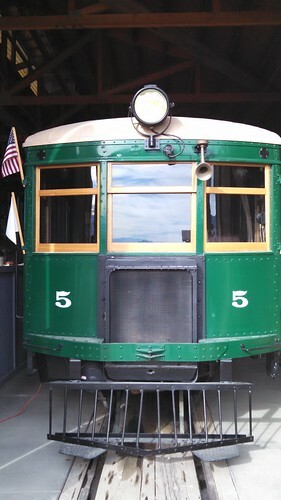 The star of the museum's collection is SP narrow-gauge locomotive #9, the "Slim Princess." #9 is not operable, but has recently been cosmetically restored after many years of deterioration in the desert. 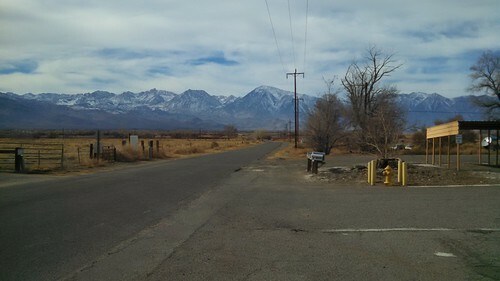 This is the view from the parking lot west toward the precipitous eastern slope of the Sierra Nevada. 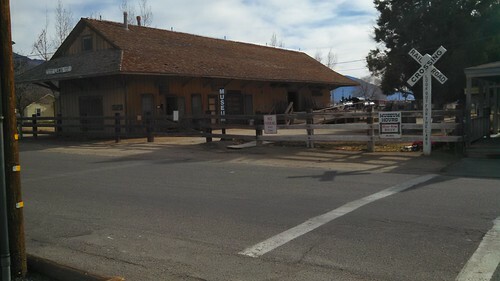 Here's the Laws Depot, a combination passenger station/freight house, with #9 visible in the distance. We started at the information building to the right, paid our suggested donation of $5 each, and proceeded to look around. 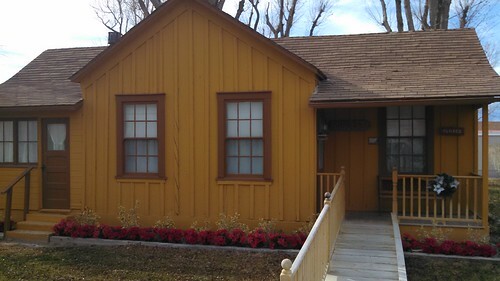 The Station Agent lived in this house on the grounds of the depot, provided by the SP. A short distance of the narrow-gauge (3 foot) track still runs through the grounds, ending at the depot building. We climbed aboard #9 for a closer look. 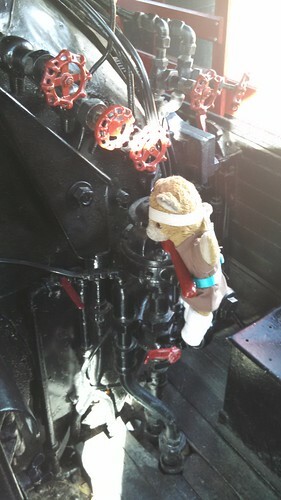 travelswithkuma tries his best here to operate the engineer's air brake valve, but even on a small locomotive, it's a bit much for a small Bear. 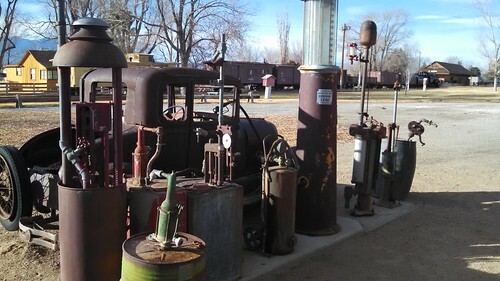 In the days when #9 chugged between Laws and Keeler, interchanging with the SP standard-gauge lines at Owenyo on the "Jawbone" branch, it took on fuel oil from the tank on the left and water from the tank on the right. 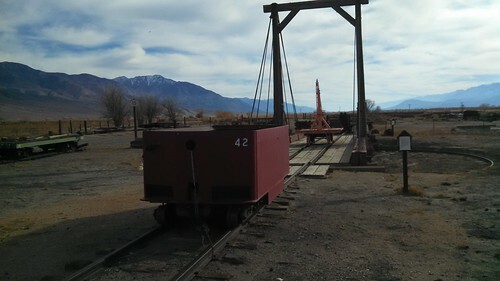 Locomotives were turned for the return trip to Keeler on this "Armstrong" turntable, so called because, being manually-operated, you needed strong arms to wrestle the locomotives around on it. The track to the right leads to the turntable, while the one on the left heads south toward Keeler. Much of the right of way apparently is intact, although the rails were lifted in 1961. One of the museum volunteers who showed Lisa and me around said that most of the ROW is on land owned by the Los Angeles Department of Water and Power, who bought up much of the Owens Valley for its water rights. There's more to see than railroading here. 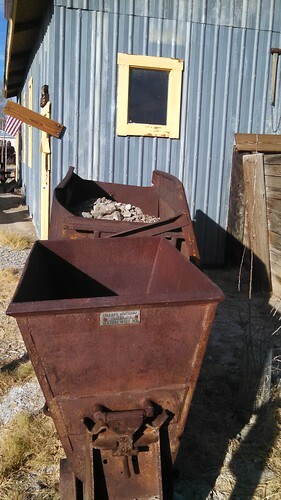 There are extensive exhibits about the mining operations in the area, including this, which is billed as the last car of tungsten ore from the nearby mines at Mt. Tom that closed in 1990. 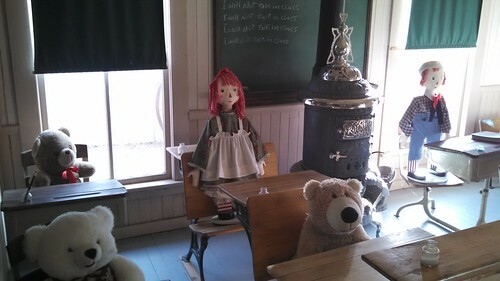 The original North Inyo school, which included a bedroom for the teacher, was moved to this museum site and restored. I think this car's owner is wondering if that service station attendant is ever coming back. We finished up in the museum's gift shop/book store/visitor center/office. Among the books we bought was the Images of America book on Bishop, which meant we could get it autographed by one of the co-authors, who was working in the museum's office that afternoon. 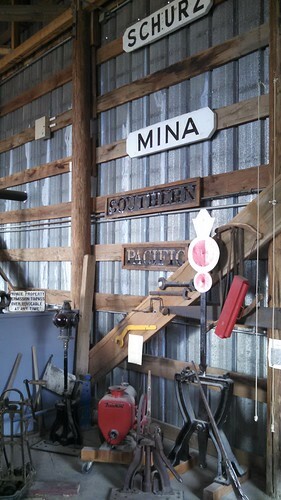 The full set of photos I took today at the museum is on my Laws Railroad Museum Flickr Album. We spent most of the afternoon at the museum, and we effectively had the run of the place, as we were one of only three parties who visited today. It is, however, a weekday at a very slow time of the year. It was a good day to be there, though, as it wasn't too cold (except inside some of the buildings) and the weather was clear. We told the folks at the museum that we'd made special plans (and taken an extra day off from work) just to come here, and that we've also made a point of telling the hotel and restaurant staff with whom we've been dealing that the museum was what brought us here. Having been rail museum volunteers ourselves, we think it's important for the businesses to know that supporting the museum is good for their business, too.